There are games in which coaching makes a real difference. Besides providing leadership and strategic direction, a coach sometimes makes crucial tactical decisions during the game. 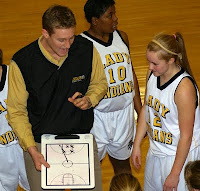 Diagramming an excellent play during a timeout may even result in a memorable, last-second victory when your players execute the plan to perfection. But despite your contribution, it’s usually a mistake for you to take any direct credit for your team’s success. Your players will begin to question your motivation and integrity—especially if you preach a team-first philosophy. I made this blunder once in a middle school basketball tournament game. With a couple of seconds remaining on the clock, down by one point, I called a timeout. We were directly under the opponent’s basket so I called our “Box” out-of-bounds play. Normally, the two forwards located on the blocks screen for the guards positioned at the foul line. The guards then dive towards the basket looking to receive the inbounds pass. The other team had seen this simple play a number of times. To possibly catch our opponent off-guard, I told my best forward on the ball side to take two steps toward the guard at the foul line, and then sharply reverse direction and cut back toward the ball. I recall Andrew smiling at me, but there was also a curious, questioning look on his face. Andrew was a great, warm-hearted kid who, in his modesty, let my imperfect moment pass without comment. Let the glory go to your players and quietly enjoy the personal satisfaction of knowing that you made an excellent game-time decision.